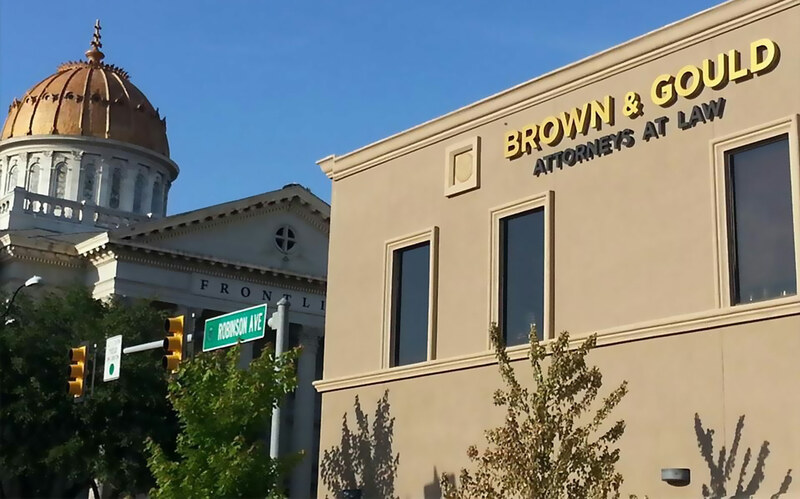 At the Oklahoma City, Oklahoma, law firm of Brown & Gould, PLLC, we provide representation for clients with a wide range of issues throughout Oklahoma and Texas. Our skilled lawyers stand ready to resolve legal disputes involving divorce and family law, employment law, medical malpractice, business litigation and other matters. Clients rely on our capable legal services. We are committed to effectively resolving the complex legal challenges of every case. We now accept payment by credit card. Follow the button to pay your fees. Please call 405-235-4500 or send an e-mail by completing the form listed below to find out more about how our experienced attorneys can help resolve your issue. For your convenience, we will be glad to schedule an off-site, evening or weekend appointment. The Oklahoma City, Oklahoma, law office of Brown & Gould, PLLC, serves the nearby cities of Moore, Norman, Edmond, Nichols Hills, Midwest City, Del City, Yukon, Mustang, El Reno, Shawnee, Tulsa and other areas, including Oklahoma County, Cleveland County, Canadian County, McClain County, Pottawatomie County, Tulsa County, Logan County and throughout the state of Texas in the cities of Dallas, Fort Worth, Houston, San Antonio, El Paso and Austin.